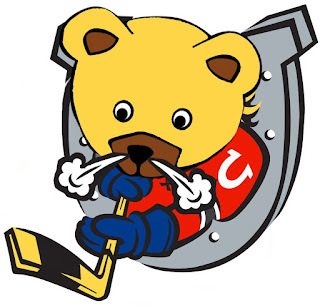 Barrie Colts host successful Teddy Bear Toss. Suggestions for Future Tosses. #OHL - Very Barrie Colts | A website covering the Barrie Colts of the OHL. The Colts had a pretty decent turnout last night with an announced attendance of 3,426 fans, tossing teddy bears onto the ice in excitement, even though their team was held scoreless in their second straight game and 4th game this season. Also, tough when the toss generally happens when the home team scores.. Anyways! Here are some of the shots from around BMC of the moment the teddybears had a picnic.. On the ice! It was really great! Sincerely I would like to thank the Barrie Colts, Barrie Fire and the sponsors who help make the event possible! After events like this, even when successful you need to look at ways to help make next years event even better! I feel that that would be tough to do. Again, Hockey, helping kids at Christmas and throwing stuff is fun! How can you improve on that? 3,426 is a pretty good crowd for a Thursday night and is fairly consistent for a Thursday at BMC. November, 24th game was a Thursday night and the attendance was 3,475. November 17th had 3,366 and October 20th had 3, 312. So did the event itself draw more people into the arena to participate in the event? Sadly, I don't think so. I also wish the team would consider doing their Teddy Bear Toss game on the Saturday at BMC. More fans = more teddy bears. Would Saturday be a good idea moving forward for this event? I feel the hope is to get more donations. More donations require more fans in attendance. Fans attend Saturdays. Saturday, November 26th had 4,100 fans. Saturday, November 18th had 3,980 fans and Saturday, November 12th had 4,197. The least attended game over those nights still had 500+ fans more than the game last night. Note that this is not a knock on the team or fans. Thursdays are slow, and obviously they would be. Colts games are mostly attended by families and it is harder for families to come to Thursday games because it is a school and work night. Maybe the thought is holding an event like this on a Thursday would get more fans out? Sadly, that doesn't change availability for children and their parents.
.@OharaTrevoro it would even be more incentive to get more fans out for a Saturday game. Maybe that's why they choose Thurs? I really don't want to believe that the choice to make the event on a Thursday is an attempt to get more fans out. I feel the goal should not to help boost sales on a slower night but to help give the kids a better Christmas. It seems pretty simple that more fans will bring in more teddy bears. Saturday brings more fans. Maybe in the future the team will consider moving the event to a Saturday night. Either way, they had a decent turnout and were able to gather a solid pile of donations which is what the event is all about. Again, thank you to the team, Barrie Fire and the sponsors for making this event happen and thank you to all the fans for their donations. I hope that we can find a way to make it a bigger success every year!